As I shared last year I have always loved the significance of celebrating the 4th of July. I am sure that my years studying History and loving teaching History have a huge part in that love. As a child I loved the fireworks but as an adult I am reminded that there is such significance in celebrating our countries profound and unique heritage. I hope that on this day that we take to celebrate our countries beautiful freedom you and your loved ones are blessed. 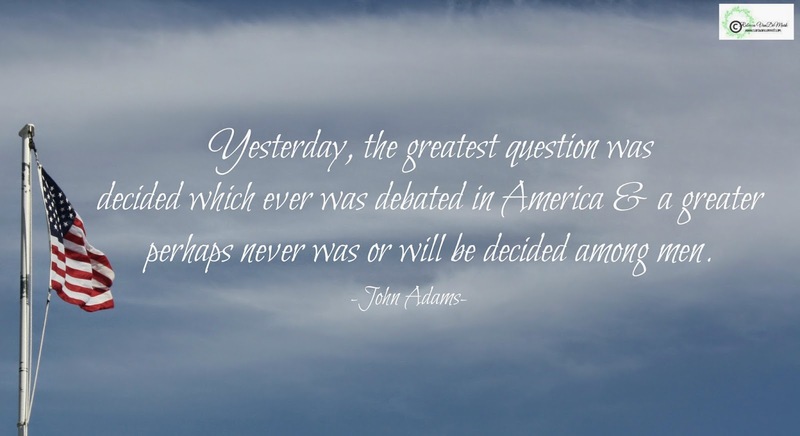 Did you know that the quote above was written by John Adams to his wife Abigail from Philadelphia in 1776? How proud I am of our country and those who have fought for it and ensured our freedom. How proud I am of those who have sacrificed so much to prove this statement true. For all of the differences in our country we remain resolute in the knowledge that we are free. p.s. - Want to see some additional July 4th quotes? Check out this post HERE! Happy 4th Rebecca! Hope you have a great holiday.